Throwing a Mardi Gras party for a group of kids isn't the same thing as cramming into the French Quarter with your girlfriends, but there's Mardi Gras fun to be had in the comfort of your own home. 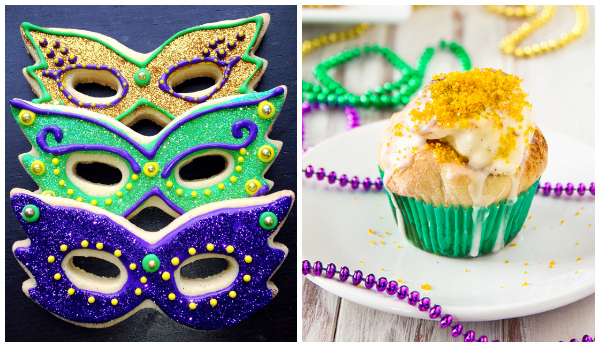 Pinterest has a load of Mardi Gras craft and snack ideas — and we've added a few bonus ideas for kid-free parties, too! Having a play date with a theme is a fun way to change your everyday routine. Invite your favorite kids and moms, and celebrate Mardi Gras kid-style this year. Don't worry about putting together things to keep the kids busy. Pinterest is the go-to place for your party planning needs. You'll find everything from Mardi Gras crafts to kid-friendly snacks, including tutorials and easy ordering information. Welcome your Mardi Gras guests to your temporary Bourbon Street with this decorative Fleur de Lis Mardi Gras Wreath (Etsy, $58). The grapevine base is decorated with beads and tulle in the iconic Mardi Gras colors — green, purple and gold — and features a gold Fleur de Lis. 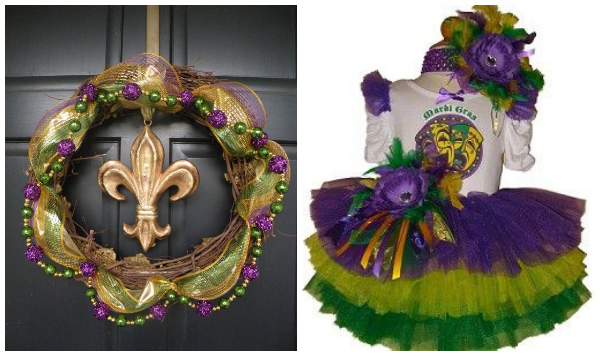 Your Mardi Gras girl will adore this Mardi Gras Tutu Set (Southern Wrag Company, $75). She'll be festively adorned in a beribboned, fun tutu and fluffy elastic headband. It's the perfect outfit for a themed play date. Nothing is cuter than handprint crafts made with your child's quickly growing hands. Materials and instructions for the Mardi Gras Handprint Mask can be found at Stockpiling Moms — your little ones will have to supply the child-size handprints! 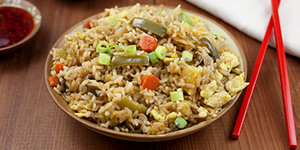 Like Stockpiling Moms on Facebook for all sorts of simple but effective tutorials, recipes and deals. Mardi Gras Outlet is an excellent resource for all things Mardi Gras. Whether you're looking for Mardi Gras beads, other supplies or Mardi Gras-inspired recipes, they have everything you need. Kids will love wearing their personalized jester hats created from the free Paper Jester Hat Pattern printable. 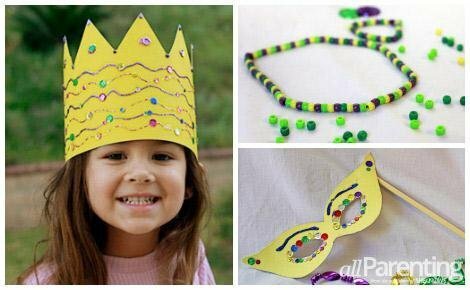 AllParenting's Michelle Maffei tested four kid-friendly Mardi Gras crafts. With only a handful of simple materials, even young children will be able to make any of the four crafts, keeping them busy from the time the play date starts all the way until snack time. If you really want to wow your little guests, try these intricately decorated Mardi Gras Cookies (Etsy, $15 for 3). If you're having other food at the play date, they'd be perfect little favors, wrapped in gold cellophane and tied with purple and green ribbon. The cookies can be custom ordered in vanilla, chocolate, lemon or mint, so they're truly a customized treat. For a decadent treat, serve individual King Cake Cupcakes instead of an entire King Cake. With a cream cheese filling and light glaze, they're sweet enough to feel like dessert, and their pastry-like texture is perfect for a late morning or early afternoon playdate. You'll find more fabulous recipes from Shawnda of Confections of a Foodie Bride on Facebook for even more delicious content. 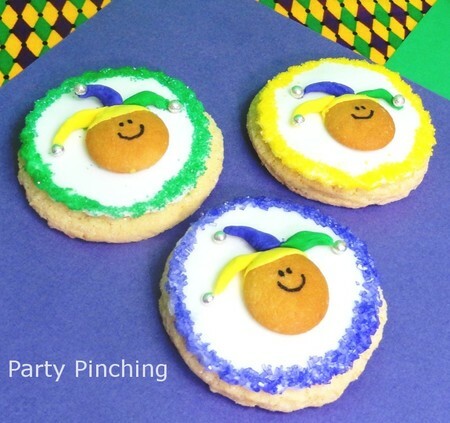 Let kids help decorate Festive Mardi Gras cookies for a combination party craft and snack. They might need a bit of help with the jester hats, but most of the decorating is child-friendly. Norene is at Party Pinching — and on Facebook — providing all sorts of festive, budget-friendly ideas for themed parties.